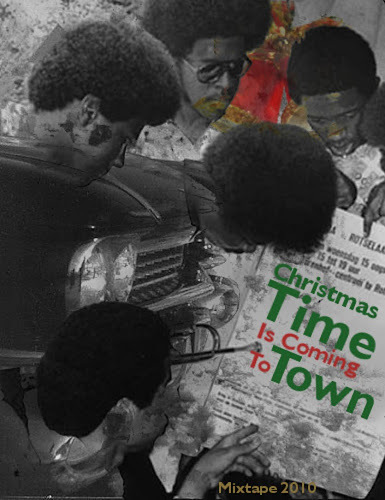 Here's my contribution to the stream of Christmas mixes that are flooding the blog. I wasn't going to post a mix, but I received an offer from Ryan "The Coolest Cat Around" Portnoy to participate in a "good-old-fashioned mixtape swap". So, I figured that I would post the results here for you guys to enjoy as well. If you are unfamiliar with the ever-coolness of the Portnoys, check out some of their projects at http://kellanstudios.com/. This past year and a half, I have fallen in love with soul, gospel, and garage music, so it is appropriate that the music of this mix reflects that. These tunes are the ones that have been bringing a special amount of merriment to my holiday preparations. Hopefully, it will do the same for you. "A Mix of BlackForrestry: Christmas Time Is Coming To Town"
Please let me know if the tracks download out of order or there are any other issues when downloading. fantastic mix joshua. i'll comment further after repeated listening. the image is awesome in every way. track 26 needs numbers in the post. that bill withers tune really is so so good. that for your efforts. love you brother. merry christmas. Cool mix! Download did not work for me though. It appears to be a 116Kb .rar file. ?? I am still coming back here yearly to yoink songs for my own yearly mixes. You're a master. Thanks, Mara...I'm glad that you're still getting some mileage out of them....have happy holidays!!! !